This is another great topic for a winter blog post, as it turns out, because for about ten months of the year, we don't have to think about the dude. Who is the dude? Well, actually, the dude is a WHAT, as I’m sure you already know if you've spent any serious time in Israel. Except that, while in North America our house had a big huge water heater in the basement, powered by natural gas, that kept the water at a nice cozy high temperature 24/7/365 (unless we went on vacation and left just the pilot light on), Israelis (and some others) have figured out that that doesn’t make much sense, because for 20-some-odd hours of the day we simply don’t need hot water. Therefore, most homes in Israel have a switch for the dude, somewhere near the bathroom, so you plan ahead and turn on the dude, which is electric, about 15-20 minutes before you need hot water. It heats up, you take your shower, end of story. It can be a hassle to remember this ahead of time, but lots of things in life are the exact same kind of hassle. Most of us don’t keep a kettle full of boiling water on the counter in case we want tea or coffee, we fill up the kettle and plug it in and cool our heels while we wait patiently for our drink. Because of the solar panel, whenever it’s sunny out, which in Haifa is apparently 300 days a year, we don’t need to bother with the switch – it automatically collects electricity and heats up the water, giving us hot showers on demand, without any planning ahead. There are surprisingly few minuses to this way of heating up water, but one is accessibility. 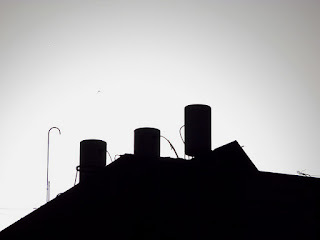 While our water heater in Toronto was conveniently down in the basement, in our laundry room, where we could get at it anytime, our dude here is up on the roof, four stories above us and inaccessible except by ladder through a mysterious hatch out onto the roof. So if the dude decides, one fine day, to burst a leak and start spritzing water like crazy all over the neighbourhood, not only is there not much we can do about it ourselves, we might not even find out about it until the neighbours alert us, like ours did one fine day. When our dude was busy spraying the entire front yard of our building. When our water meter was quietly spinning like a Fourth of July pinwheel out in back of our house, racking up a massive water bill. Fortunately, there was a guy here, a dude dude, so to speak, literally within half an hour of my calling the landlord. They take water leaks pretty seriously in a country where water can’t afford to leak. He grabbed a ladder from somewhere, disappeared through the mysterious hatch, and within a few hours, the problem was resolved. Not so much for the building across the street from us a few years ago, when my husband looked out our front window one blustery morning to see the dude literally topple off the building and fall, relatively harmlessly, into the empty lot next door to the building. I’m pretty sure that doesn’t happen too often, but it was pretty early in our lives in Israel and extremely alarming to think about since almost every building is bristling with these things. The dude-springing-a-leak thing is pretty common, given all the pipes, tubing, flanges, gaskets, nuts, bolts, and whatever involved in piping water up, heating it, and then piping it back down again into our sinks. Last summer, I noticed we were getting sprayed on our way to and from our building and it turned out that the building next door had a leaky dude up on top of it. So leaky, in fact, that a weedy little tree began to grow on the roof, which we noticed from the ground floor, four stories down, when it finally got big enough to see from the ground. I reported the leak to the city, who said I’d have to tell the local vaad (neighbourhood committee), who said I’d have to tell the homeowner, who we didn’t know. So in the end, nobody did anything (despite my aforementioned comment that Israelis care about water leaks because we can’t afford to lose any of our water! ), but eventually, for whatever reason, the leak stopped, and the tree gradually dried up, though it’s still up there. One of the interesting things I've learned travelling out to visit my daughter is that in Palestinian settlements, the dudes are black rather than white, giving you a quick way to tell which kind of place you’re in, although by the time you start noticing what’s on the rooftops, you may be a little close for comfort. I’m pretty sure I’m not the only English speaker who never noticed this before! Looking into the differences a little, I found this site (in Hebrew only, sorry, but if you paste the URL into Google Translate, it will happily translate the entire page for you! ), which explains a little more about the Israeli dudes and their Arab cousins, the black dudes. As the comments explain more fully, the black dudes are plastic cisterns, as opposed to white metal water heaters, and they’re only there to collect water in the event that the water supply is cut off. 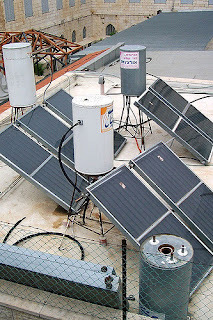 One of the comments points out that when Palestinians use solar collectors, the boilers are “grey cubes.” I have no idea what that means, so if you know, please enlighten me. 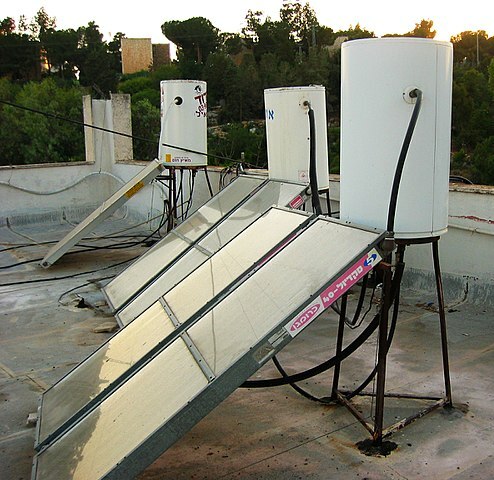 Arab cities and villages in the rest of Israel use the ordinary solar dudes, which are required by law in all buildings up to nine stories high. A while ago, there was a law considered to extend the requirement to taller buildings, but as far as I can tell it didn’t pass. Learning to live with the dude is one of the things I seriously love about living in Israel. Like dual-flush toilets, it’s one of the ways I feel like we’re about two decades ahead of the rest of the world. Which maybe just about balances out the near-total lack of recycling where we live, and the fact that people still feel free to smoke in almost every open area, even when they’re with toddlers, which to my Canadian eyes is the next-worst thing to a criminal offense. Hopefully, the rest of the world will catch up to Israel in the dude department soon and everybody, everywhere, will just take the short wait in stride as they brush their teeth and get their clothes ready, and otherwise kill a few minutes, before stepping into a toasty warm shower. 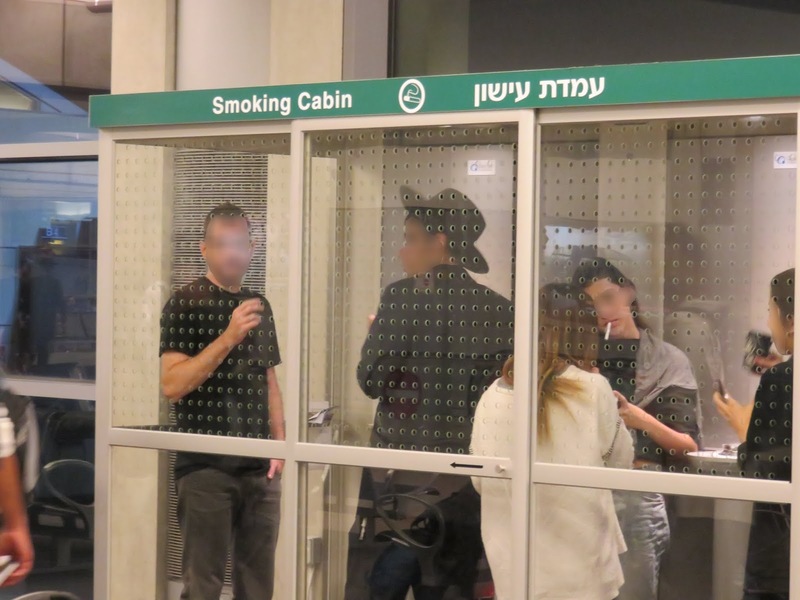 Which totally beats stepping into one of those smoking booths, if you think about it. If there’s a lesson there, however, I’m not sure what it could possibly be. Love from chilly Israel – hope you’re staying warm this winter! In the "mountains" we keep our dude on a timer half the year. 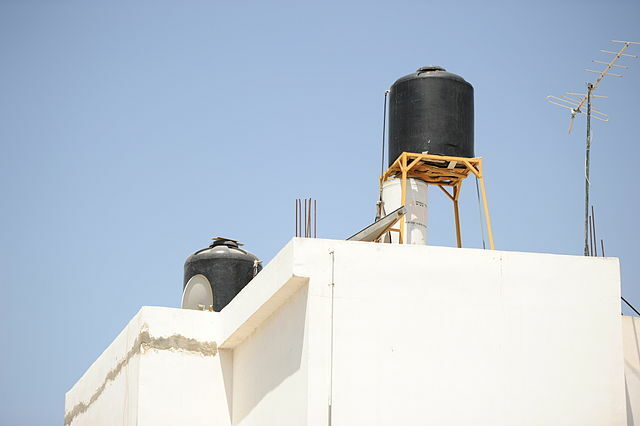 And the black things on the Arab homes are for water storage. When we lived in a Shomron yishuv, our water tank (and our downstairs neighbor's water tank) were in our attic. Sometimes guys would show up, unannounced at very early hours of the morning, to adjust or fix something in the neighbor's tank. The neighbors didn't always tell us ahead of time. We didn't always let the men in unannounced. The neighbors eventually learned it was better to communicate with us, or they'd have to arrange for the guys to come back. Today is "in the Shomron" day....We have a spare water tank in our house, and had the דוד leak/stop working over the first 17 years in the house. After a trip back to Toronto and experiencing hot water on demand, and suffering through too many tepid showers on Fridays, we had a gas heating system put in and our world has changed for the better. No one needs to wait for two hours after Shabbat to wash dishes anymore. One of the problems in Yerushalayim with all the exposed piping is that sometimes the temperature drops to around zero and the pipes freeze and sometimes burst. The water company suggests that when the forecast is for low temperatures, you leave the hot water running with a small trickle to prevent freezing. But some people don't do it. A few years ago I remember walking down our street in Katamon the morning after a very cold night and there were waterfalls pouring down almost every roof in the neighborhood!